Soap-Shield is a prepared commercial copper-based spray product. It's sprayed on leaves and surrounding plants to deter and kill fungus causing rust or blight. Common rust (Puccinia sorghi) appears on plants, such as tomatoes or corn, in damp areas with heavy dew and moderate temperatures. The spores are airborne and can spread in the garden. Soap-Shield Flowable Liquid Copper Fungicide is available through Gardens Alive. The product is made up of a copper base in a fatty acid liquid mixture. This mix forms a true soap. It is most effective as a preventative measure sprayed on leaves and plants. Reapply after a rain or about every two weeks. Soap-Shield decomposes and is used by soil microbes. 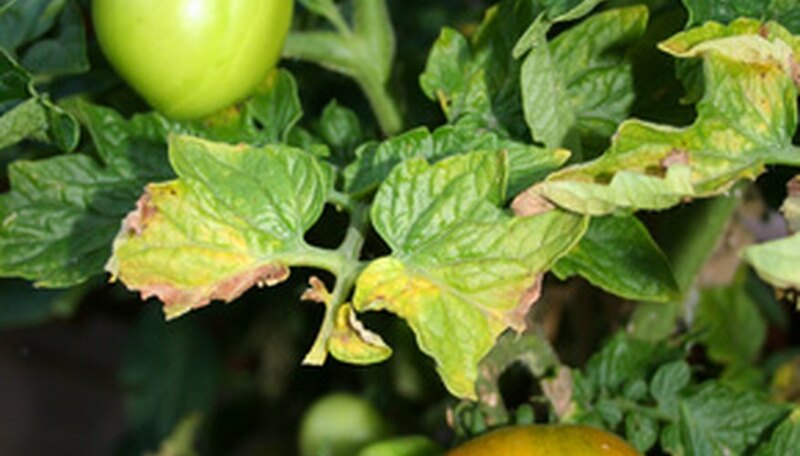 Tomato rust disease appears as orange spots on the leaf. These blister-like spots contain orange dust, or rust spores. These spores will disperse if the blister opens. Spores can be air- or waterborne. Early and late blight are also fungal diseases of the tomato plant. All will show leaf spots, sometimes concentric circles of yellow, orange or brown, as the first sign. Late in the season, these spots will be black. The risk of tomato rust disease can be reduced by watering early in the day and by watering at ground level. Rotate the location of your crops and clear out all debris at the end of the season. Space your plants so that there is adequate air circulation. Planting disease-resistant types of tomato plants is the best prevention. These include Supersonic, Better Boy and Jet Star varieties. The effects of fungus on tomato plants are progressive. Early blight is often caused by a spore that has overwintered in the soil. Tiny black spots appear first and grow, causing fruit to drop off before ripening. Late blight is a fungus that likes cool and moist climates. It will kill a plant in four to five days. The entire plant will be affected and should be removed from the garden. Always check the product label for the proper mixture of any fungicide. Soap-Shield requires a ratio of 2 oz. per gallon of water maximum. Be careful not to put infected plants or leaves into a compost pile, as this may spread the disease when the compost is used in the garden.